I CHOOSE YOU. AND I'LL CHOOSE YOU OVER AND OVER. 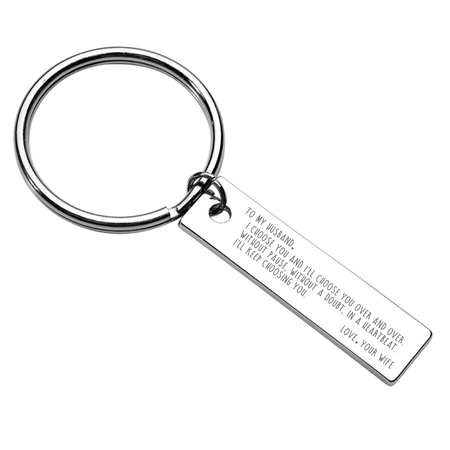 I love the sentiment on the keychain but was very disappointed that the printed message was so small I had to use a magnifying glass to read it. My husband is really hard to buy for & doesn't really wear jewelry. This filled my need to buy him something meangful that makes him think of me & he has anytime he's not with me!! It's smaller than I thought it would be, but that is ok in the end. The keychain is lovely, although I was surprised at how small the writing was. My husband loved it! We've been married for 45 years & he couldn't change his key ring fast enough! Thank You!